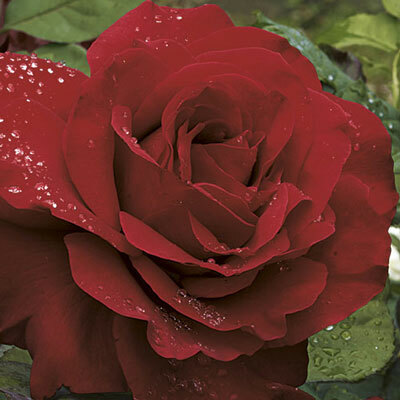 MONSTROUS buds & HUMUNGOUS blossoms of rich ruby red hold their durable brilliance from beginning to end. IMMENSE petals (just one can cover a child's palm) lend a classical Hybrid Tea bud shape, slowly spiraling open to a ruffled WHOPPER of a show-stopper. LARGE lettuce-like leaves of an unusual red-green color gracefully enrobe the long cutting stems—in perfect proportion to the flower. Who needs a bouquet? It only takes one PRODIGIOUS posy to fill a vase. Most massive in the spring.